A large piece of shell or even the tears of St. Lucy (Italy), or Shiva eye (India) called. Normally is the size of a few centimeters. This has a diameter of 10 centimeters. This shell must be very old and a rare piece. The special is because of this kind in the spiral shell on the flat side of the shell. Normal is the front-colored painted in iridescent. 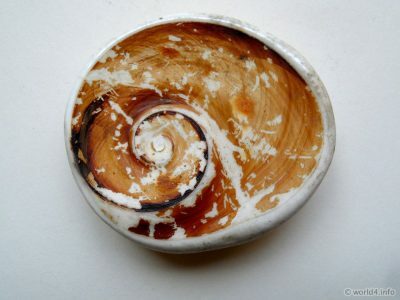 The piece is actually the opening of a shell, which closes the sea snail at risk.